A new device developed by Stanford University researchers could make it easier for doctors to monitor the success of blood vessel surgery. The sensor, detailed in a paper published Jan. 8 in Nature Biomedical Engineering, monitors the flow of blood through an artery. It is biodegradable, battery-free and wireless, so it is compact and doesn’t need to be removed and it can warn a patient’s doctor if there is a blockage. Monitoring the success of surgery on blood vessels is challenging as the first sign of trouble often comes too late. By that time, the patient often needs additional surgery that carries risks similar to the original procedure. This new sensor could let doctors keep tabs on a healing vessel from afar, creating opportunities for earlier interventions. The sensor wraps snugly around the healing vessel, where blood pulsing past pushes on its inner surface. As the shape of that surface changes, it alters the sensor’s capacity to store electric charge, which doctors can detect remotely from a device located near the skin but outside the body. That device solicits a reading by pinging the antenna of the sensor, similar to an ID card scanner. In the future, this device could come in the form of a stick-on patch or be integrated into other technology, like a wearable device or smartphone. The researchers first tested the sensor in an artificial setting where they pumped air through an artery-sized tube to mimic pulsing blood flow. Surgeon Yukitoshi Kaizawa, a former postdoctoral scholar at Stanford and co-author of the paper, also implanted the sensor around an artery in a rat. Even at such a small scale, the sensor successfully reported blood flow to the wireless reader. 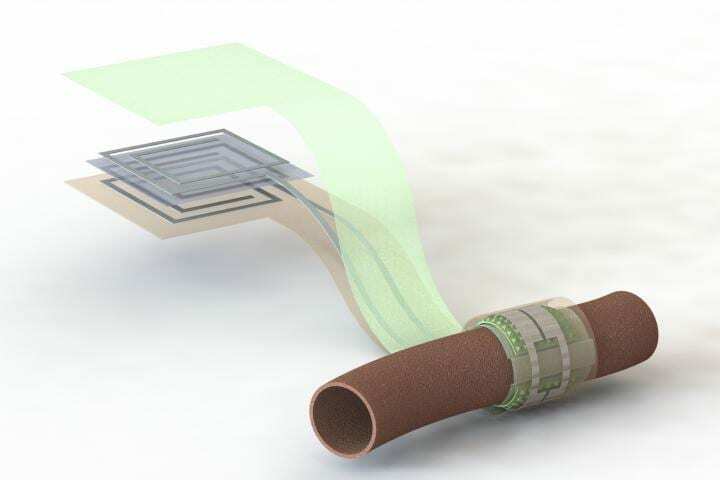 At this point, they were only interested in detecting complete blockages, but they did see indications that future versions of this sensor could identify finer fluctuations of blood flow. The sensor is a wireless version of technology that chemical engineer Zhenan Bao has been developing in order to give prostheses a delicate sense of touch. The researchers had to modify their existing sensor’s materials to make it sensitive to pulsing blood but rigid enough to hold its shape. They also had to move the antenna to a location where it would be secure, not affected by the pulsation, and re-design the capacitor so it could be placed around an artery. The idea of an artery sensor began to take shape when former postdoctoral fellow Clementine Boutry of the Bao lab reached out to Anaïs Legrand, who was a postdoctoral fellow in the Fox lab, and connected those groups – along with the lab of James Chang, the Johnson and Johnson Professor of Surgery. Once they set their sights on the biodegradable blood flow monitor, the collaboration won a 2017 Postdocs at the Interface seed grant from Stanford ChEM-H, which supports postdoctoral research collaborations exploring potentially transformative new ideas. “We both value our postdoctoral researchers but did not anticipate the true value this meeting would have for a long-term productive partnership,” said Fox. The researchers are now finding the best way to affix the sensors to the vessels and refining their sensitivity. They are also looking forward to what other ideas will come as interest grows in this interdisciplinary area. Additional Stanford co-authors include Clementine Boutry (co-lead), Christopher Vassos, Helen Tran, Allison C. Hinckley, Raphael Pfattner, Simiao Niu, Junheng Li, Jean Claverie, Zhen Wang and Yukitoshi Kaizawa. Bao is also a member of Stanford Bio-X, a senior fellow at the Precourt Institute for Energy, a fellow at Stanford ChEM-H, an affiliate of the Stanford Woods Institute for the Environment and a member of the Wu Tsai Neurosciences Institute. Chang is also a member of Stanford Bio-X. Fox is also a fellow at Stanford ChEM-H. This work was funded by the Swiss National Science Foundation, the European Commission, Stanford ChEM-H and the National Science Foundation.